While I’m sure a Ridley Scott sequel to his smash-hit, Alien (1979), would be fantastic by any stretch of the imagination, the choice to go with similarly-successful James Cameron in the director’s seat helped to keep the franchise from becoming too stale. Of course, with a sequel appearing seven years after the original, Alien had plenty of time to rest on its laurels before the follow-on film came along. Watching Aliens (1986) with the knowledge of James Cameron’s other work, it soon becomes apparent that this movie is all his own. After all, if I told you there’s a James Cameron film about space marines invading an alien world to eliminate an alien threat, many of you would think I’m referring to Avatar (2009) and not Aliens (1986). In the original Alien, much of the focus of the film is on survival, let alone how to defeat such an unstoppable creature. For Aliens, the tables have turned, and man is now on the offensive, even if they don’t take the threat as seriously as they should. Aliens has its moments of terror and horror, but they aren’t nearly as jarring as they are in the original. Instead, the strength of Aliens lies in its action as much as it is in its memorable one-liners. From Bill Paxton’s freak out, “Game over, man! 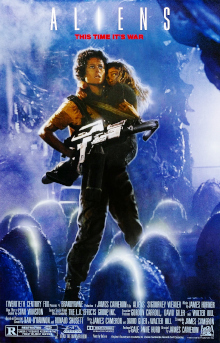 Game over!” to Sigourney Weaver’s defiant challenge in the final battle, Aliens is more in line with a summer blockbuster than its predecessor ever was. Even though both of these films in the Alien franchise are exemplary in their own right, one can’t help but notice that they’re almost the same script, even down to the final vanquishing of the titular alien. Sure, both have a different approach to it (of which I almost prefer the robot-suit ending of the sequel), but it ends up being a tad disappointing to basically watch the same events occur again without much deviation from the formula that worked once before. A different and action-packed take on the original Alien film, I give Aliens 4.0 stars out of 5.